William B. ‘Bill’ Watkins Sr. Lion Bill Joined the Loudon Lions Club and was inducted in January 1986. He served on various committees and elected positions at the Club level culminating as Club President 1990-1991. He served as Zone and Region Chair and as District Governor of District 12-N 1995-1996. He served on various District 12-N and Multiple District 12 Committees and Boards 1996 to present. Lion Bill was elected to serve as an International Director 2007-2009. 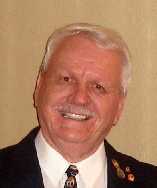 He served on the Lions Clubs International Constitution and By-Laws Committee, and Audit Committee. Lion Bill traveled to over 30 states, Canada, and 4 foreign countries as a member of the International Board on speaking and other Board duties. Lion Bill has written over 50 poems, 5 plays, and the original MD-12 Policy Manual about Lionism. He has written and presented numerous seminars on Lions orientation, leadership, membership, extension and retention. Lion Bill has received many awards, citations and medals in appreciation for his ongoing Lionistic service, such as 6 International Presidents Certificates of Appreciation, International Guiding Lion medal, International Lions Leadership medal, 2 International President Medals, and Lionism’s highest award the Ambassador of Good Will medal. Lion Bill is a Progressive Melvin Jones Fellow, a Lindsey Jennings Fellow (Tennessee), a Dr. W. P. Woods Fellow (Indiana), and a member of the fraternal group of One Thousands Vanguards for the Melvin Jones Lions International Memorial (Arizona).